What's in a Story? - Write. Click. Scrapbook. Have you ever stopped to consider the impact your family's stories have on yourself or your children? What about your brothers and sisters? Which family stories do you tell over and over at the dinner table? Now, consider what would happen to your sense of the world if those stories were lost or if you didn't know them. Really! Take a minute, I'll wait. Got it? Okay, read on. Historically, stories define who we are, what we stand for and ultimately how we see the world. Cultures without a formal written language hand stories down through the generations orally, telling them over and over through a designated orator or someone whose job it is to see that he/she remembers the stories for the village and then retells them. These orators are highly respected Elders for good reason: They are responsible for the entire history of their village. 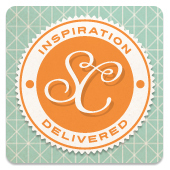 As a scrapbooker, I'm sure you're keenly aware that if you don't tell your story, no one will. It was this kind of thought pattern that led me on a small journey last week down the path of family history. Being the youngest of six (my oldest brother is 20 years older than I am) and having come from a divorced family, there are many stories that I'm not familiar with. There are also people whom I've never met whose stories I haven't heard. It was a treat to hear about my great grandmother. But there was one story that I'd only heard in snippets - the story of my mom and dad's marriage. It just always seemed like a taboo subject so I never asked, fearing that I might hurt someone's feelings. That's the "blue" in me coming out ;) I finally broached the subject and I'm so glad I did. This is the only photo I have of my parents together and now I have the story saved for my children. These two pages will always be treasures to me, not just for the photos, but for the stories. If you're not sure where to start, try using a quiz created just for the occasion and interview your prospect or fill in the quiz according to what you read about a person. Ella Publishing has a brand new eBook called Quick & Creative Quizzes that may be helpful to you. Also, be sure to check out our WCS gallery for more inspiration and ideas about telling your family's stories. So, what's in a story? It's the essence of who you are and what you will become. It's your history and your future all at the same time. Pretty important stuff, huh? Here's your challenge: Research one ancestor or family member that you don't know much about and then create a page or two about that person. Be sure to upload it to our Flickr group by clicking on the link above. I can't wait to see what you create. Happy hunting!